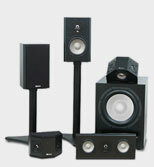 Retrieving real deep bass and reproducing it in your home theater or listening room at real-life levels is not easy. In fact, there are laws of physics that dictate how deep a subwoofer will extend its bass output, and as often as not some of these work against simple physical limitations of room size and placement. For example, other things being equal (and each of the following may be manipulated to achieve certain gains at the expense of other performance factors), the larger the subwoofer box is in relation to the diameter of the woofer, the deeper the bass output will be. (One enthusiast I know installed a huge driver in one wall of a room in his house, using the adjoining room as the enclosure! When this is fired up, the entire house resonates. Is it any surprise that this gentleman lives alone?) Put another way, the smaller the box in relation to the driver, the less deep bass output will be. Or we can get somewhat deeper bass by reducing the driver size along with the box but sacrifice maximum loudness. How low do we need a subwoofer to go to deliver audible output? Human hearing extends to about 20 Hz, and although there are frequencies deeper than that—some huge pipe organs actually produce a fundamental tone at 16 Hz— they are typically more felt than heard. Certain natural or man-made events such as earthquakes and explosions also produce lingering reverberations that we feel more than we hear. If you feel the vibrations in a church pew or in the floor, you are likely feeling 16 Hz or so, but actually hearing the second harmonic at 32 Hz. To most of us, hearing a 32-Hz harmonic of a pipe organ sounds really low and it is but in order to deliver real-life impact, a fine subwoofer needs to add that ultra-low felt component at 16 Hz, and deliver significant output in the 20-Hz region. Virtually all popular subwoofers achieve some bass output in the 20-Hz region, but they do so only through the assistance of room reinforcement and advantageous placement in the room. (And that's also how the sub's performance is measured, by advantageous placement of the measurement microphone in a area or node of bass reinforcement.) All of this works as long as the room isn't too big. In fact, many of us have experienced very deep bass in a car equipped with a good sub, because of the small volume of air in the passenger compartment. But in a larger space like a big room, true 20-Hz subwoofer output is hard to get. And it's this content that adds the enormous "wow!" element to movie soundtrack effects, and furthers the realism of great orchestral music. Train crashes and artillery all produce frequencies in the 20-Hz region, as do orchestra bass drums, pipe organs, synthesizers and even some pianos. All notes from a musical instrument, deep bass included, are made up of a fundamental tone and harmonics, which occur at mathematical multiples of the fundamental tones and help give each instrument its tonal signature or identity. For example, even if different instruments—trumpet, sax, and piano—all play the same note of identical pitch and frequency, each instrument will sound quite different. This occurs because each instrument's harmonic makeup gives the instrument its distinctive sound. It's harmonics that make a sax sound like a sax and a piano like a piano. That's also why we are still able to hear a 16-Hz organ pedal tone, because we actually hear the 32-Hz harmonic, which is much louder than the 16-Hz fundamental. However, if our subwoofer doesn't reproduce any of the 16-Hz energy, then we won't feel as much and it won't seem as realistic. The same goes for soundtrack effects. Attempts have been made (not really successful) to reduce the subwoofer enclosure size and try to compensate by using very large amplifiers and huge magnet assemblies (to take the extra power) in order to produce deep bass extension and output. But ultimately, box-size-to-woofer-diameter rules! You can extract tones as low as 40 Hz from a small sub by putting it in a smaller room in a favorable location a room mode or corner (a node in a room can give you 6 dB of boost). Similarly, some available ultra-compact and expensive cube subwoofers do produce fairly low frequencies, but they have real limitations in maximum output. They simply won't play low frequencies at anything approaching real-life loudness. If the sub's output is 9 dB down (-9 dB) at 32 Hz (about half the output at 70 Hz), you would need eight times the power to correct for the 9-dB loss (you must double the power for every 3 dB of boost applied). If you started out using a 200-watt amplifier, you would have to increase that to a 1,600-watt amplifier and then lose most of those gains to the driver required to take the power! Let's say we wanted to design a sub that could truly reach the 20-Hz level or deeper with no more than a 4-dB drop in output in an anechoic environment. First, the laws of physics dictate that the box must be large. There is no way around this. You would also need to incorporate an efficient amplifier because true deep bass extension requires enormous output (over 400 watts) in order to achieve sufficient loudness at these frequencies. It also must have the power to drive a large woofer and move the requisite quantities of air. Early on in Axiom's design process for its no-compromise subwoofer, an all-analog amplifier design was considered—and rejected. Why? Analog amplifiers have only about 50% efficiency, so if the subwoofer required a 500-watt analog amplifier to drive a 12-inch driver in a large enclosure, it meant that the amp would draw at least 1,000 watts from the AC line. Unfortunately, there is limited access to total power from a house AC outlet. At the least, such a sub might trip the circuit breakers at peak output or cause brownouts and disrupt performance of other household electrical appliances. The alternative to this scenario was apparent: a digital switching amplifier, because of its inherent high efficiency of 90%. Many existing subwoofers already use digital switching amplifiers because they are efficient, cool-running, lightweight, and relatively economical. But conventional digital subwoofer amplifiers have a severe limitation: no headroom. When a digital amplifier reaches it output limits, instant distortion results. And given that movie soundtracks and large musical works have sudden dynamic swings that demand sudden bursts of power, this didn't seem the appropriate choice. The solution was to design an analog power supply (not a digital switching supply) that would give the digital amplifier plenty of headroom for large dynamic peaks. 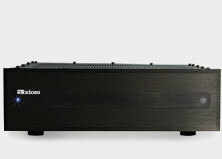 Axiom's new EP600 and EP500 DSP subwoofers both utilize a powerful digital amplifier with an analog power supply. The analog power supply provides the needed headroom to prevent the digital amplifier from going into distortion. Additionally, output devices were selected for their ability to deliver huge amounts of current. The new design produces 600 watts with headroom to spare. Axiom also realized that an entirely new driver design would be required to handle such power and attain the design goal of deep bass response to 17 Hz with a maximum undistorted output greater than 110 dB SPL. But one enormous problem remained: how to make the subwoofer deliver smooth and consistent performance to its output limits (16 Hz) without overtaxing the driver and the amplifier. The answer was to use Digital Signal Processing, and a custom-designed algorithm. The latter term is in common usage amongst digital engineers (not so common to acoustical engineers though), and in essence, it's a kind of digital road map that can be programmed by the engineer to command a digital signal to perform in a particular way with a specific driver. The EP600's DSP circuit and algorithm know in advance the performance goals of the sub, the output capabilities of the powerful digital amplifier, and the capabilities of the new driver. It automatically corrects any slight deviations of the big woofer away from the design goal, and it also prevents the subwoofer amplifier from exceeding its output limits and going into distortion. 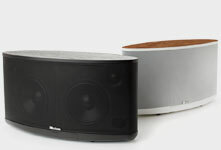 The result is a subwoofer that offers unprecedented performance. The EP600's output measured anechoically (in a room with total absorption) or in free air, extends to 17 Hz +/-1 dB and to 16 Hz +/-3 dB. Used in a typical room with the boundary reinforcements that normally apply, extension to 13 Hz is possible. The EP600's ELF (Extended Low Frequency algorithm) DSP enables maximum sound levels to an unprecedented 111 dB anechoic, and 122 dB SPL in a typical room, output and extension that are clearly able to reproduce Godzilla's footfalls at real-life levels! 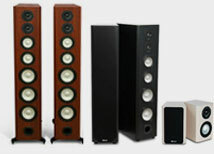 And because of the DSP, the EP600 can't be overdriven into distortion. You can keep increasing the volume level with impunity. It will reach its maximum and go no further, nor can you damage the driver. All the time the DSP's algorithm tells the amplifier to stop delivering more power to the driver to prevent distortion. While it's operating, the DSP constantly monitors the power supplied to the driver, correcting any tendency for the driver and system to deviate more than 1.5 dB away from the performance goal (linear output in an anechoic environment). What this means in practical terms is that if you feed any frequency between 17 Hz and 100 Hz to the EP600, it will deliver that frequency with, at most, an undetectable variation of 1.5 dB. And it will mine even lower frequencies with as much precision, all the way down to 17 Hz with the same 1.5 dB of variation. Some of the EP600's other characteristics are relevant: It weighs 100 pounds, and you can request it in a horizontal version so you can conceal it behind a sofa or put it away at one side of the room. And for those willing to accept just 2 dB less in maximum output (109 dB anechoic/120 dB in-room) and a bit less extension to 19 Hz anechoic and 15 Hz in-room, there is the EP500, a somewhat smaller version with the same massive driver, slightly less power output (500 watts vs. the larger sub's 600 watts), and, at €1,217.00 EUR, a price that's less than the larger sub (the EP600 is €1,625.00 EUR).